Digital TV switchover begins in East Yorkshire and Lincolnshire | What Hi-Fi? Digital switchover has begun for TV viewers in East Yorkshire, Lincolnshire and Scarborough. Analogue transmissions of BBC Two have been permanently turned off at the Belmont transmitter, which serves 712,000 homes, and digital TV signals boosted to reach all areas. 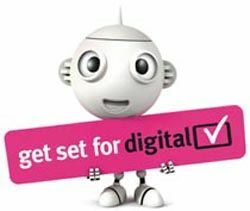 The Scarborough TV region also completed stage one of digital switchover this morning (August 3rd) when BBC Two was turned off at the Oliver's Mount transmitter. The start of TV switchover means thousands of viewers in digital blackspots such as Grimsby, Lincoln and Weaverthorpe can get Freeview channels for the first time, says the Digital TV Group. Homes already watching Freeview will need to retune their TVs and set-top boxes to regain BBC services which may currently be missing. Both switchovers will be completed on August 17th, when the remaining analogue channels will be switched off. Further Freeview channels from ITV, Channel 4 and Channel 5 will then be available from local transmitters in the region for the first time.